Your personality based on the analysis of your natal chart. The Natal Report completed with the analysis of your karmic indexes (Lunar nodes, Dark Moon, retrograde planets and part of fortune). The comparative analysis of both charts in your relationship. Your astrology forecasts dated from the analysis of your planetary transits. 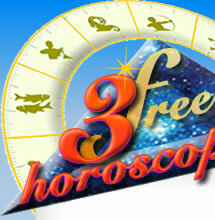 Your annual astrology forecasts from the analysis of birthday and natal charts. Please check your entry because it will be given no response to incomplete application, especially if the email address is wrong ! We generally respond within 2 business days (excluding weekends and hollidays). Make sure your anti-spam software won't block the receipt of emails coming from 3horoscopes.com. Data protection act: Your data are strictly confidential and secure. In compliance with the article 34 of the French Data protection act of 6 January 1978, you are granted the right to access, modify, rectify or delete your data. © AstroQuick 2011-2019 - ALL RIGHT RESERVED. The reproduction, modification, distribution, transmission or republication of any material from this site is strictly prohibited without the prior written permission of Astroquick.